If you can’t make it to an offline event, there are multiple online ways to participate, including writing a blog post about a women in STEM whose accomplishments you admire! Just write your blog post, publish it, and then head on over to findingada.com to add your story to their collection. I am celebrating by participating in Design Your World, a STEM for Girls conference, on October 19 with my Fashioning Circuits project. In addition, I’m giving a talk on “Fashion and the Threads of Digital Literacy” at the end of the month (A new talk on diversity each Friday in October; Free tickets here). 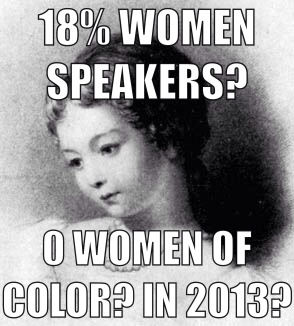 Let’s all actively work toward a future in which I no longer have any need to use my Sad Ada Lovelace meme! I invented a new meme: Sad Ada Lovelace. Thanks to http://www-history.mcs.st-and.ac.uk/PictDisplay/Lovelace.html for the image.